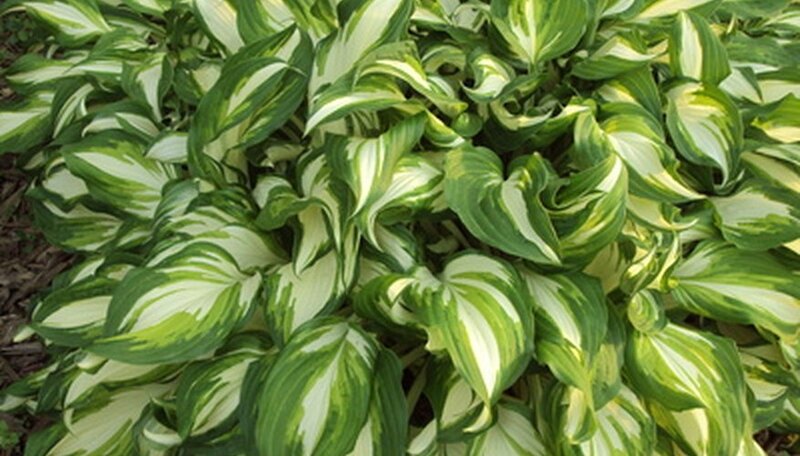 Hostas are a member of the lily family grown primarily for their striking foliage. But the very thing that appeals to humans about hostas also appeals to deer. In areas where people and deer must coincide, hostas are often sought out by deer as browse. Many homeowners resort to repellents to drive deer away from their landscaping. Fence your yard to keep deer away. Although an 8-foot fence is typically required to keep deer completely out of a yard, deer shy away from enclosed spaces. A shorter fence can be effective at keeping deer out simply because it encloses a yard. Place a strand of electrical wire near the top of the fence as an added deterrent. Plant hostas closer to your home. Deer prefer to graze in locations further away from human habitats. By placing hostas closer to your home, you reduce the instance of damage by deer. Dust hostas with cayenne pepper or bitter apple spray, which makes the leaves taste unpleasant and prevents deer from grazing extensively. Reapply after each rain. Collect unwashed human hair from your own hairbrush or a beauty salon. Scatter the hair around your hosta plants or place two handfuls of hair into a mesh bag and hang near your hostas. The smell will help keep deer away. Add more hair each month. Mix 2 parts egg and 8 parts water in a blender. Pour the mixture into a spray bottle and spray over your hosta plants. The smell of the mixture will help repel deer. Reapply the mixture after each rainstorm. Purchase travel-sized soap from a discount store or collect it from a hotel during your next stay. Place soap in a mesh bag and hang it near your hostas. Replace soap monthly. If possible, change soap brands so the deer do not become accustomed to the fragrance and begin to approach your hostas.